I'll admit it, I was pretty snobby when it came to Sangiovese up until very recently. When I thought of it, I thought of those cheap Chianti in the raffia containers that seem so drinkable when you're on holiday in Florence, but don't seem to translate well to a rainy, autumnal evening in south London (or wherever else you choose to imbibe your wine). Like all intrepid wine geeks though, I was determined to find out what all the fuss was about when it came to this famous grape. After all, there must be a reason that people rave about it; surely? A recent trip to Tuscany was the perfect opportunity for me to broaden my horizons and look to see whether I needed to reconsider my opinions. Now that I'm back from my trip I can confirm that I am very much a convert to Sangiovese. For me, it ranks up there with Pinot Noir and Nebbiolo as one of the finest red grapes. So what made me change my mind? Montepulciano the town is an achingly beautiful hilltop town that lies to the south east of Florence (see left). All around it are nestled hundreds of vineyards that form part of the Commune of Montepulciano. The vineyards produce a number of products from basic table wines, to their entry level red "Rosso di Montepulciano" (which is aged for a minimum of one year in barrel and has at least 70% Sangiovese), and the very best produce the rather fantastically named "Vino Nobile di Montepulciano", which has to have at least 80% Sangiovese in it but can contain up to 20% of other local red grapes such as Canaiolo Nero and is aged for at least three years in barrel. Interestingly, and rather confusingly, there is actually a grape variety called Montepulciano, although it has nothing to do with the wines of Montepulciano! 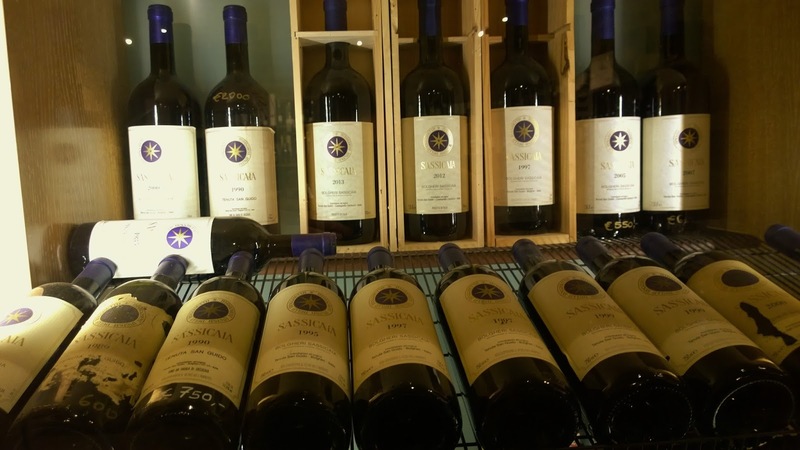 The town itself is a wonderful spot to be a wine lover, there are little Enotecas all around town offering you the opportunity to sample their wares, along with olive oils, local salamis and cheeses. 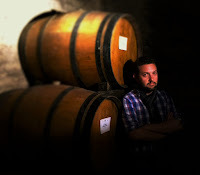 A particular highlight was visiting the old Etruscan wine cellars of the Palazzo Ricci, where the stone caves have been used by the vineyards associated with the Palazzo to age their wines in huge barrels (as evidenced by this photo of a rather moody looking me in amongst the barrels). Most of the wines that I sampled around the town were retailing in the €10 - €20/bottle price range, they were pleasant enough, nice fruit notes, decent acidity; but I hadn't found one that I could really write home (or indeed a blog) about until my last evening when I went to the rather fabulous La Bottega del Nobile for a meal on my birthday. I told the sommelier that I had yet to have a bottle of Vin Nobile that really got me excited and that it was his challenge to find me one. He was pretty excited about the opportunity to show off his wine range! 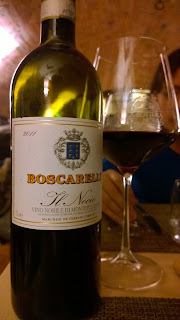 He selected for me the 2011 Il Nocio Boscarelli (Montepulciano, Italy), which was a 100% Sangiovese wine. After five minutes in the glass it really started to express itself, intense notes of red fruits with some vibrant sweet spice (cloves and nutmeg) aromas. On tasting what was immediately noticeable was its plentiful acidity, but this was coupled with a generousness - this was certainly no tight or austere wine. The flavours were predominantly of small, juicy red and black berries. There were hints of tannins there, but these had certainly softened to leave a very approachable and elegant wine. 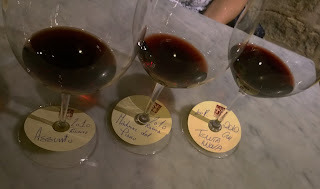 Naturally this wine was pricier than the others I had tried (the shop attached to the restaurant retailed the wine at €77), but it was nice to find confirmation that the Vin Nobile could live up to its name! If Montepulciano got me interested in Sangiovese it was the wines of Montalcino that got me hooked. Another beautiful hill-top town, of which Tuscany has an embarrassing large number of, with a history steeped in wine. The wines of Montalcino are, just like those of Montepulciano, categorised according to how they have been stored and aged; the entry level wines are called "Rosso di Montalcino" and are typically only aged for six months in oak and a further six months in bottle, whereas the top level wines from the estates are called "Brunello di Montalcino" and are aged for at least two years in barrel and further year in bottle (in practice most age it for longer). In some estates they pick the very best of their grapes each year to make an even more special wine called a Reserva. My wife and I were doing a walking holiday and had to walk one day between Montalcino and a town called Bagno Vignoni - when I saw that our route took us past one of the best regarded Montalcino estates I immediately contacted them and asked if we could do a tour and a tasting, I was thrilled when they said that they would! The estate in question is Casanova di Neri (which means the new house of the family Neri - nothing to do with the (in)famous lover!) We were taken around by Pier Luigi who showed us around the wine making facilities, which had just finished processing the 2016 harvest. The estate has 68 acres of vines sited across three different vineyards and produces an average of 230,000 bottles of wine per year - including a small number of whites. 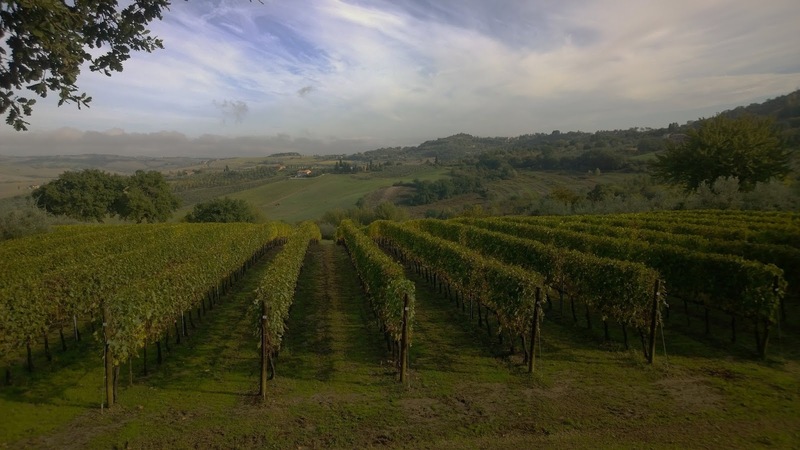 To produce their premium wines, they produce two single vineyard wines that are designed to show the expression of terroir that they believe Sangiovese gives. We started with their 2014 Rosso di Montalcino had pleasant notes of cherries and violets, on tasting there was a gentle grip of tannins that gave it some structure - a decent entry level wine. Things got exciting as we moved onto the Brunellos; we started with a 2011 Brunello di Montalcino, which was light in the glass and on the nose, with bright red cherry notes, on tasting I found it rather angular and quite insistent with its acidity suggesting that it will need a bit of time to open up. Next up we moved on to a 2009 Tenuto Nuova Brunello di Montalcino, which was a lot riper and juicier on the nose, it was a really rounded wine featuring plenty of sweet fruit flavours and bags of personality. After this we moved on to the 2008 Cerrealto Brunello di Montalcino which was more floral on the nose with violets coming through quite strongly. On tasting there was more depth to this wine with some savoury notes coming through in the mid-palate which gave the wine a nice balance and complexity. 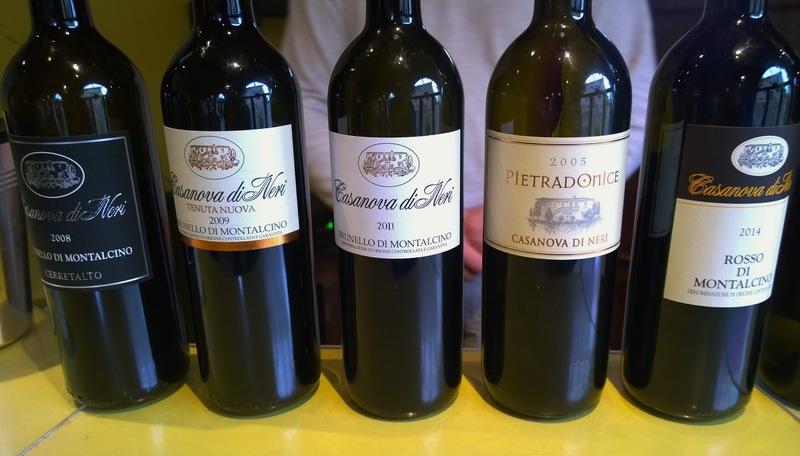 The vineyard also try out their version of the famous "Super Tuscans", ie: wines which don't accord to the rules to make them Brunellos. In this instance they created their Pietradonice which is made from 100% Cabernet Sauvignon - we tried the 2005 and were really impressed with it, it had lots of juicy blackcurrant presence, as well as some vibrant red cherry; there were still some tannins there, but these had softened up nicely to give a soft and plush wine - if this were a mid-level left bank Bordeaux you'd be pleased with it. Pier Luigi was a great host and I would heartily recommend visiting them if you're in the area. 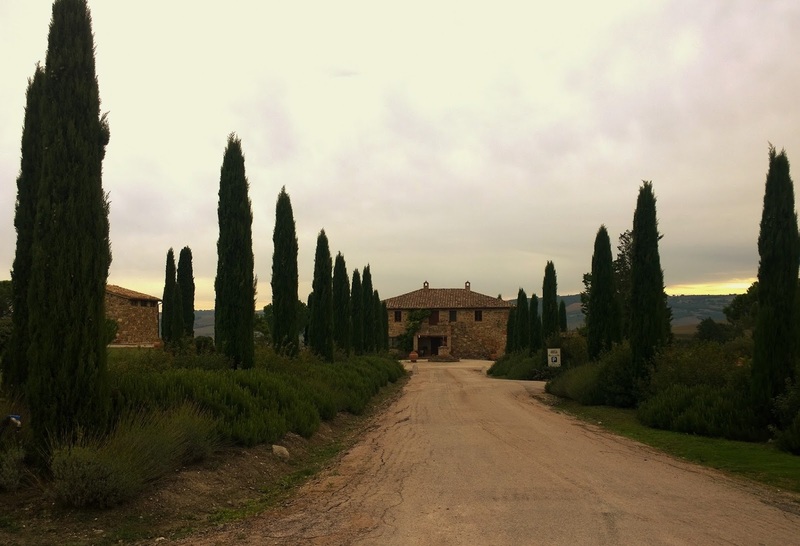 You can't go around Montalcino without noticing that something special has happened. The 2010 Brunellos are considered to be one of the best vintages in the last fifty years, they are already becoming the stuff of legend - demand is understandably very high leading to some rather eye-watering prices. We were very excited to see then that one of the Enotecas (Enoteca la Fortrezza), situated in the town's old fortress no less, were offering a special tasting of three 2010 Brunellos that had been awarded 100 points by various wise and sage people who know about these kinds of things (James Suckling, Robert Parker etc.). I made a bee-line straight for it! 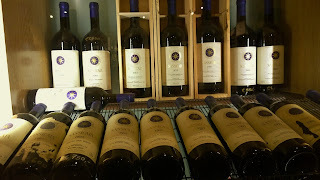 We started with a Assunto Riserva of which only 900 bottles were produced in 2010 - hence it is extremely hard to come by. This possessed some red fruit notes (red cherry), but there was a real funk of peppered salami and fennel that gave it a distinct savoury profile. There was a definite tannic profile to the wine, but this was accompanied by acidity aplenty. The flavours were predominantly of juicy and ripe blackcurrants and red cherries, with a long, pronounced finish. A blockbuster. Next up was a Val di Cava which had only just become available following six years of ageing. The nose was quite distinct, it had heady aromas of "fruits of the forest style" red and black berries twinned with dashes of smoke and bacon. Our guide though the wines, Iralt, felt that this wine needed a lot more time to age, but I was surprised to see how approachable it was already - although if you had a few bottles you would definitely want to leave a couple for at least 10 more years...! 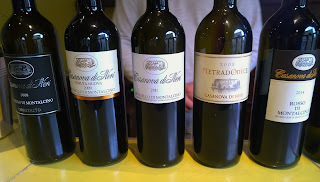 Lastly was Tenuta Nuova from our friends at Casanova di Neri! This was really elegant on the nose, markedly sweeter than the others with damson and plum notes coming through to accompany the ripe cherries and strawberries. On tasting, the wine was very full-on and fruity with lush red cherry flavours abound. The tannins were noticeable, not in their harshness but in their softness. This was an incredibly poised and finessed wine with an excellent finish. How could you follow three such delicious wines? How about with a genuine wine legend...? We were delighted that we were able to try a sample of a 2013 Sassicaia, a super-Tuscan made with 60% Cabernet Sauvignon and 40% Cabernet Franc. The aroma was very deep with a really vegetal profile to it (I thought of green peppers), which accompanied the brooding dark fruit (mainly blackcurrant) notes. On tasting, there was a familiar bite of menthol and eucalyptus from the Cab Franc, which provided a beautiful counterpunch to the blackcurrant fruit that emanated magnificently from the Cab Sauv. The trouble with drinking wine this good is that it recalibrates your sense of what excellent is. I should at this point thank Iralt for his excellent insight into the wines - he really helped us to understand and appreciate them better. Also, if you can find any bottles of 2010 Brunello di Montalcino, let me know...!